Corporal John Elsha Grimshaw, 1st Battalion, The Lancashire Fusiliers, awarded the Victoria Cross, West of Cape Helles, Gallipoli, 25 April 1915. 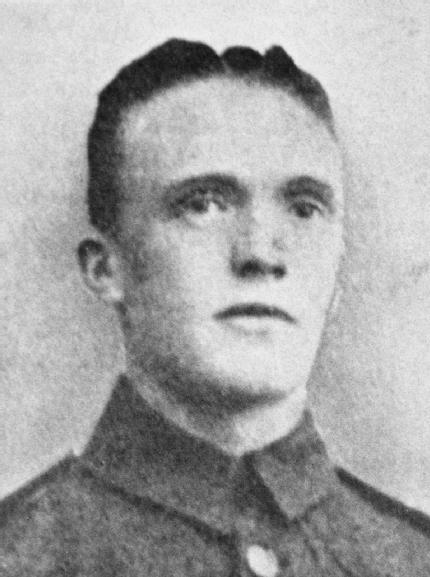 Sergeant John Elisha Grimshaw, of 406 Warrington Road, Abram, was one of the “six VCs before breakfast” during the Gallipoli landings in April 1915. These six soldiers from the 1st Battalion Lancashire Fusiliers were awarded VCs for their heroism. They were part of the “Lancashire Landings” at Cape Helles, the southern end of the Gallipoli peninsula. The Gallipoli campaign was fought from April 1915 to January 1916 and in that time approximately 400 people from Wigan Borough died, these included soldiers from both the 1/5 Manchester Regiment and the 6/South Lancashires. On the first day of the campaign the Lancashires lost 533 soldiers out of 930 who began the assault and it was on this day that Grimshaw earned his medal. The Gallipoli peninsula was difficult to attack and easy to defend, with only a few beaches capable of being landed upon. Two entire Turkish divisions were defending the area that was more favourable to attack. Along with the Australian and New Zealand Army Corps the British attacked the beaches. At a beach codenamed “W Beach”, two warships deployed 8 motor boats, which each towed 4 rowing boats to the shore (32 rowing boats in all). The rowing boats however became sitting ducks as the beach defences had barely been touched by the fire from the warships. Again, many men were killed in their boats. The beach was heavily defended not just by machine guns but also barbed wire, both on the beach and in the water. Many soldiers were caught and killed in this, which in turn impeded the soldiers behind who were trying to effect a landing from their boats. Some of the wire was booby-trapped, with mines and explosives detonating if it was cut. The soldiers were also being slowed down by the weight of the equipment they were carrying, along with their rifles becoming jammed by the water and the sand. Sir Ian Hamilton, the British commander-in-chief, said soon after the landings: “No finer feat of arms has ever been achieved by the British soldier, or any other soldier, than the storming of these trenches by the Lancashire Fusiliers”. Who were awarded medals was chosen from a ballot from the survivors and each citation didn’t give much description of each soldiers feat of arms; in the words of the local MP “Although all our lads cannot receive the D.C.M., Sergeant Grimshaw himself will agree that there are hundreds who deserve it, and all we can do is to see that when they return they shall receive the full reward for coming to their country’s aid in the time of need”. During the landing, Grimshaw had been sending information back to the beach whilst exposed to enemy fire, all the time in jovial spirits. Grimshaw was originally awarded a D.C.M. but once his heroism had been recognised he was awarded a V.C. A memorial plaque has recently been unveiled at Abram Community Garden on Warrington Road, Abram.